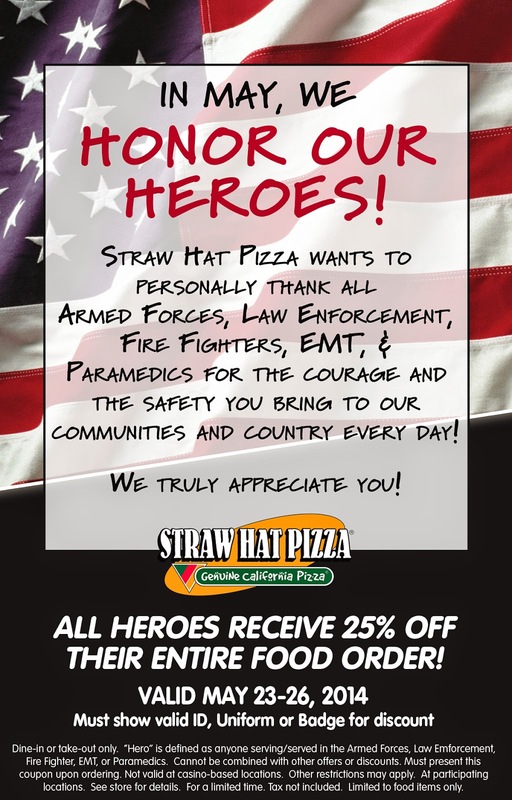 Straw Hat Pizza: Honor Our Heroes! Heroes Get 25% Off! All Heroes receive 25% off their entire Food Order! Must show valid ID, Uniform or Badge for discount. Valid at participating locations. Dine-in or take-out only. "Hero" is defined as anyone serving/served in the Armed Forces, Law Enforcement, Fire Fighter, EMT or Paramedics. Cannot be combined with other offers or discounts. Minimum purchase required for delivery. Not valid at casino-based locations. Some locations do not deliver. Other restrictions may apply. See store for details. For a limited time. Tax not included. Delivery fee may apply. Any delivery charge is not a tip for your driver. Please reward your driver for the convenience of delivery. Drivers carry less than $20.